We’ve had “cone of silence” talks and tracks since the very first BSides event using these general rules. The first BSides Austin had a complete track dedicated for “cone of silence” talks/discussions. 1. 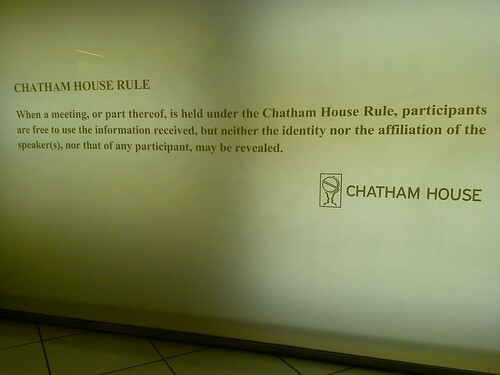 I think they should always be called “Chatham House Rules” talks, so that we let everyone know what that means. There are still uninitiated who don’t know what that means when they attend something like that. 3. For most orgs, I don’t see why you wouldn’t share information. Sure, actual breaches and incidents might be pushing the line, but even to talk about your implemented technology or weaknesses probably doesn’t open any doors for malicious attendees. 4. I don’t always need someone to say their name, who they work for, and why they’re qualified to talk on a topic. If their data/content will demonstrate that to me, I couldn’t care less. Tell me your pseudonym and go to town (and save those 2 minutes for more content!). 5. We really need orgs to be less gun shy about divulging things anyway.